This is my hope in life: to take root and blossom in my faith, relationships, and community- thriving in the present. Hey friends! Welcome to Root and Blossom. 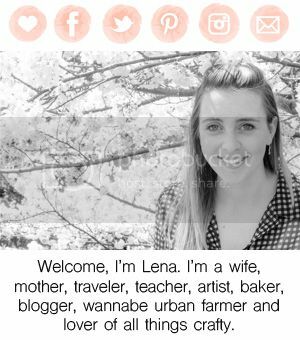 My name is Lena, and I am a wife and mother as well as a follower of Jesus Christ. I am currently a stay at home mom but was a school teacher before. I think my dream job would be to own a bed and breakfast and my husband is convinced I'll have a bakery one day. Some of my other passions include outdoor adventures, travel and DIYing. My husband's name is Christopher and he is the tall, dark, and handsome man I believed didn’t exist and the one who has taught me to love in a way I’ve never experienced apart from God. He is the most intelligent and respectable man (and engineer) I know. He too enjoys the outdoors, traveling, and creating. He’s gifted with a servant’s heart and enjoys using his hands to fulfill this role: building, construction, creating. Gabriel is our oldest son born in August of 2012. We thought we knew love and then we met little G. Every day we thank the Lord for his blessing onto our life. Gabriel is a thoughtful, reserved, yet adventurous toddler who loves the great out doors, reading books and working alongside mama in the kitchen. Brenik is our newest addition, born August 2014. Brenik has a look of perpetual surprise, is a solid sleeper, and giggles on cue. This is a lifestyle blog where I share about the ins and outs of our lives and home as well as inspirations from other talented people. That’s our family! What’s your story? We’d love to get to know you.